Yes, finally. Checked around in Napier today to see if I could get 4G coverage without luck. I live in the coverage area in Napier, but wasn't able to get on 4G. Finally figured out that I needed to go to Vodafone.co.nz and change my plan from Prepay Smart Data to Prepay 4G. And after just a few minutes I was up on 4G at home! 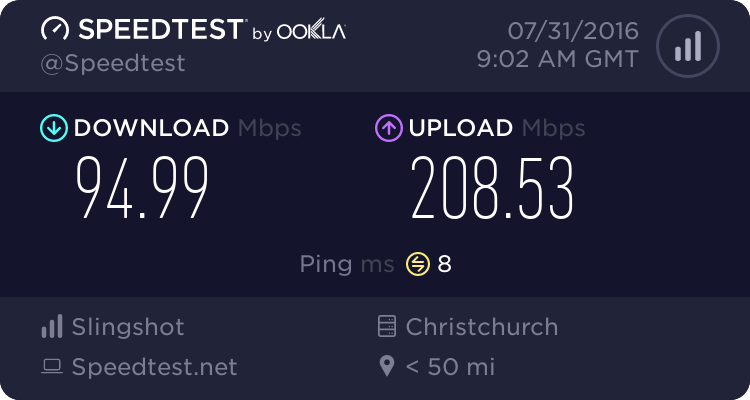 Not the worst speeds, but could they have been better? jarledb: Yes, finally. Checked around in Napier today to see if I could get 4G coverage without luck. I live in the coverage area in Napier, but wasn't able to get on 4G. That might be because a third of the way down this page http://www.vodafone.co.nz/prepay-4g/ it says "SIMs available in store 14th December". What's that about? adida101: That might be because a third of the way down this page http://www.vodafone.co.nz/prepay-4g/ it says "SIMs available in store 14th December". What's that about? I expect that'll be Vodafone Prepay 4G specific sims that will have the Prepay 4G $19 plan pre loaded on them and 4G info printed on the packaging. That way if you're buying a new sim there's just one less step to use 4G. Any indication if 4G will be made available to other prepay plans, specifically mobile broadband? A tip for everyone who has just got 4G, don't go crazy with the speed test app. I tried it this morning and it burned 70mb of data, a few goes and your 500mb is toast. I really hope Vodafone will increase the amount of data for their 4G plan. why do we need to change our plans to get access to 4G? whats the catch? why cant you just enable it on all the current connections to your network and be done with it? hamish225: why do we need to change our plans to get access to 4G? whats the catch? why cant you just enable it on all the current connections to your network and be done with it?